Sometimes living so close to nature is very exciting. We don't have easy access to malls and the excitement the city brings, but we are able to take advantage of things I never knew about when I lived near a large metropolitan area. Last week we learned that they were putting identification bands on some Osprey babies. We decided to see what it was all about. Unfortunately the banding was cancelled. The process relies on Alliant energy and due to storms, the truck was busy with downed power lines. It was rescheduled for today. Our time was not wasted last week. While at the park we did see the pair of Osprey nervously flying around the nest. 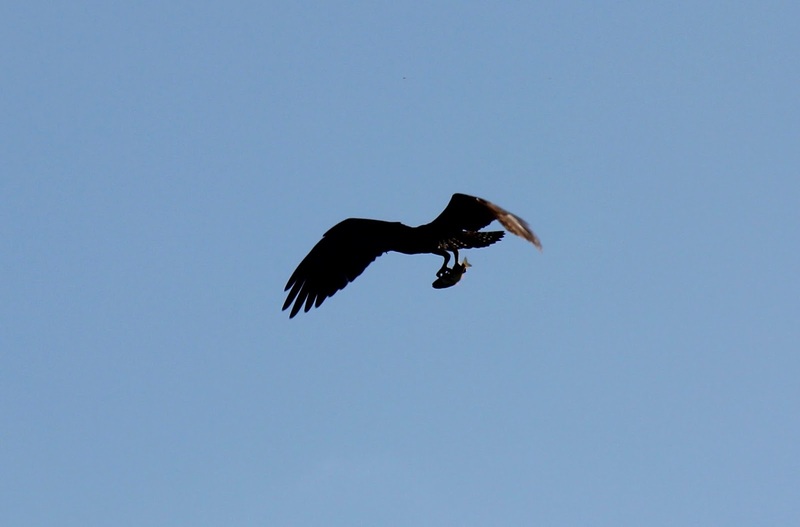 One had a fish in it's talons and was waiting for us to leave so it could feed its babies. In fact, when one of the babies was being weighed, a fish bone fell out. It was picked clean. The city of Green Lake Wisconsin on Green Lake the deepest natural inland lake in Wisconsin. Which name came first? 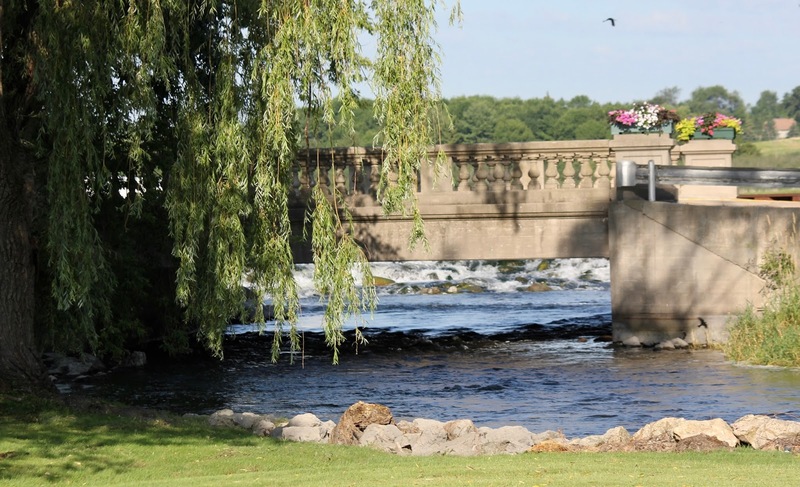 This morning we headed back to the City of Green Lake on the north side of Green Lake in Green Lake county. 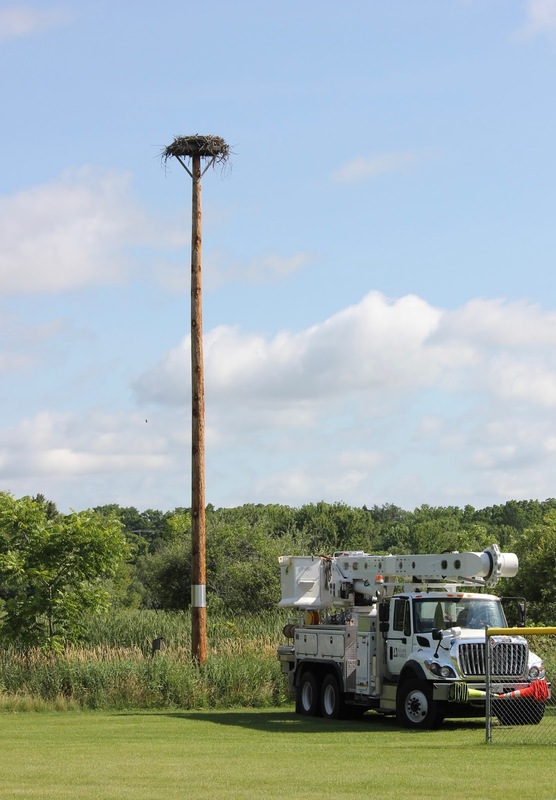 There are several platforms installed in the vicinity of the lake for Osprey's to nest. 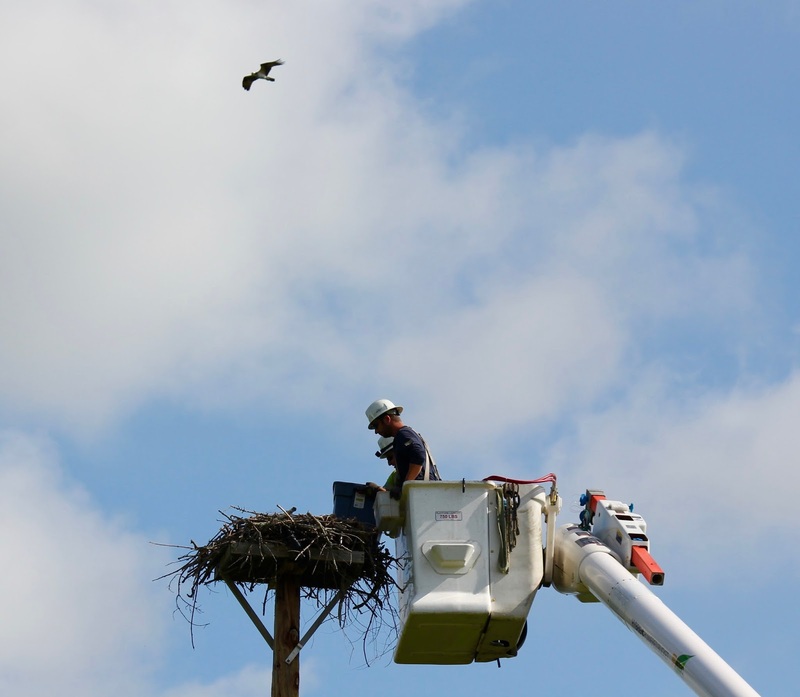 Ospreys travel north to nest and then migrate in the fall. They winter far south even wintering out of the country in Central America. Several years ago a pair of them built a nest on one of lights on the baseball diamond in the city. After a few years, a new pole and platform was installed behind the diamond. 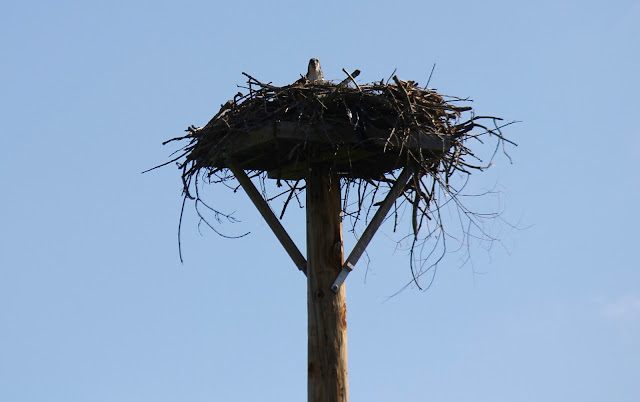 From that point, the birds have used the platform for their nests. 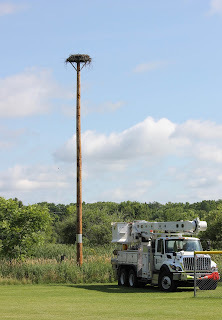 This is the original nesting spot on the ball diamond lights. A local group built a platform to fit on an old power and the power company lifted it all in place. 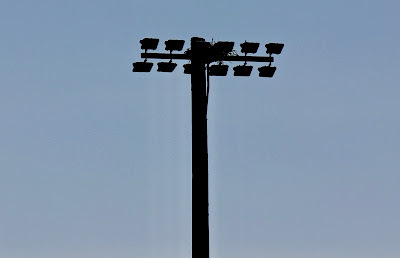 As we approached the baseball field, we could see the Alliant energy truck had arrived and was already in place. A Biology professor from Ripon College was also there as was a well known wildlife artist who lives in the area. 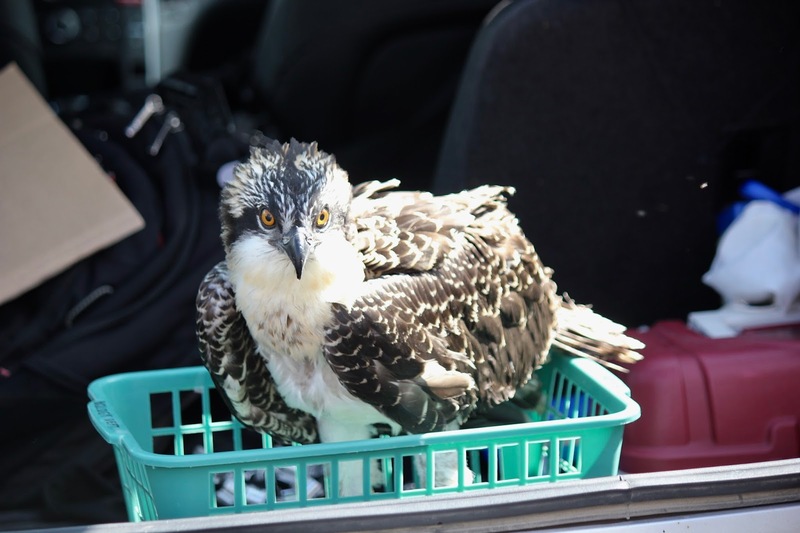 The professor has banded hundreds of bluebirds and spent several years banding local Ospreys. They band them in order to identify them if one is found dead or seen in an area and to track locations. She teaches ornithology. Tom Schultz is the artist who has illustrated several field guides to birds. He started a Green Lake county bird and wildlife group and is on the committee of the Wisconsin Breeding Bird Atlas project. They know what they are doing, so it was fun to watch. 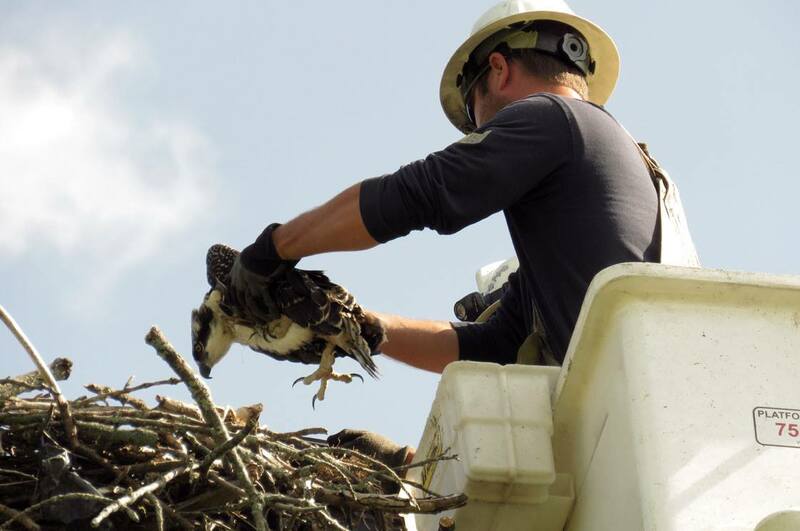 Several crew members from Alliant got into the lift bucket and raised themselves up to the level of the birds. At this point they discovered there were three baby osprey. No one knew how many birds were in the nest because there is no camera installed to view the nest. They estimate the birds are six weeks old. The crew member picked up each bird and carefully placed it in a plastic bin. The wings of the birds are very fragile at this stage, and they have to be careful not to injure the bird. Then they lowered the bucket and brought the baby birds over to be weighed and banded. Since the birds can't fly yet they can be placed in a basket to be weighed. All three were in the larger range so it was determined they were all females. They weighed between 3.5 to almost 4 pounds. Apparently male birds are lighter than that. After they were weighed, they were banded. The bands have to be put on with a pliers. In the past they banded with a ring that didn't overlap, but the raptors have such strong beaks they could pry off the bands. Now they have a band that can't be taken off. Even baby birds have strong and sharp talons. The band is on her left leg. The bands have a number and contact information in case the bird is found. Quickly returning the birds to their nest. It was an awesome experience to witness. I hope next year we can bring our grandchildren to see the process. It is something I won't forget.